It is a myth that the British had radar and the Germans did not. They most certainly did and by the end of the war it was more advanced than ours as I hope this short page will show. 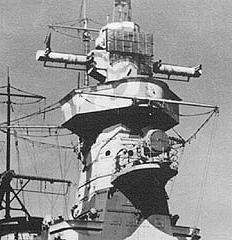 Hulsmeyer's early work led to intermittent German research only, but in March 1934, before Watson-Watt had even started, Rudolf Kuhnold head of German Navy Research, prompted by the sucess of sonar, obtained a radar reflection from a battleship across Kiel harbour. Six months later he could detect a ship at seven miles distance. By 1936 the GEMA company had provided an 8Kw set operating on 1.8 metres which detected an aircraft at 28km. This led to the pocket battleship Admiral Graf Spee being equipped with a gun ranging radar known as Seetakt during a refit in 1938. A much smaller version was fitted to U boats with two arcs of dipoles fitted around the outside of the conning tower. GEMA went on to construct the Freya (on the right), the original version being able to detect an aircraft at over fifty miles although not its height. Also Wurzburg was demonstrated as an ack-ack radar with a range of eighteen miles, later to be improved to an accuracy of half a degree and a range of almost sixty miles. 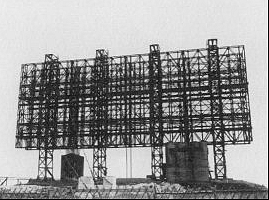 So rather than smugly thinking that we were well ahead with our radar, it may come as a surprise to know that the Germans were thus in some ways more technically advanced than the British by 1940, although their permanent installations numbered only eight and these were confined to the German coastline. The coast of Holland was so equipped during that year and consequently the Germans were able to observe our bombing formations assembling at the outset of a raid. The British most certainly did not invent radar, only a version of it. But we did invent the cavity magnetron! That remained a secret from the Germans until February 1943 when they recovered an undamaged H2S radar set from a crashed British bomber at Rotterdam. This set them busy working on centimetric equipment, an area neglected previously. Freya was a metric rotating search radar with a range of 125 miles. It operated on a 2.5 metre wavelength with a power of 20 Kw. PRF was 500 and pulse length 3 microseconds. It had "bed spring" dipole array aerials, the one for receiving being mounted above the transmitter array and the whole thing was originally designed to be trailer mounted. A variant is the model depicted above on the right which has a lower third array with fewer dipoles which was for IFF. During the first winter of the war Freya radars on the German islands caused severe losses to our bomber formations. Its precision was such that in May 1940 at Essen-Frintrop a flak battery shot down a bomber that could not be discerned visually. 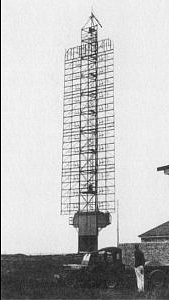 Telefunken's Wurzburg had a 3 metre diameter dish and operated on a .5 metre wavelength using a very high PRF of 3750 and a magnetron (not a cavity magnetron) delivering 6 Kw, giving a range of 6 miles when used as an Ack Ack radar. Obviously the problem of Transmit/Receive switching had been solved as there is only one dish for both purposes and a motor rotated the dipole mounted at the focus of the reflector. The entire electronics for this system required only 50 valves. Sometimes operated by a team of five, most being seated on the radar base, one man rotated the whole thing with a handwheel while observing the range and bearing on a hooded display mounted at face level, and adjusting the rotation to give maximum pulse height. A second man controlled the dish vertically, also by means of a hand wheel whilst watching the heights display and adjusted the angle of the dish to give maximum pulse amplitude. Other seated operatives then relayed the two readings from mechanical scales by radio to the control centre. A later similar but better version was known as Mannheim. The Wurzburg dish was usually fitted with additional dipoles for the IFF system. A larger Giant Wurzburg was developed with a 24 foot skeleton dish. This version had a 50 mile range due to the more efficient dish with the PRF reduced to 1875 to suit. The operators enjoyed the comfort of a cabin. This radar could also be mounted on a railway wagon for mobility. The permanent installations evolved to consist of one Freya and two Giant Wurzburgs. These controlled interceptions only within a surrounding forty kilometre (approx.) square "cell", but General Kammhuber oversaw the building of the Himmelbett line of 74 of these installations from Denmark, through Germany and France. The Freya detected a target at long range and handed its range and bearing to a daughter Wurzburg. When the Wurzburg could track it the second Wurzburg tracked and guided a defending fighter from a squadron associated with the radar installation until it saw the target on its own effective AI radar. An installation would not deal with an attacker outside its own cell, although overlap must have occurred during active interceptions of an evasive enemy. In this way in the autumn of 1943, 400 German night fighters accounted for 250 of our bombers. Flak accounted for 96. It may be considered that the German radar system was inferior to ours in that each unit operated independently - they had no central control rooms to amalgamate the information from many units as did our CH system. At that time, lacking the PPI display, the view for the Controller was provided by blobs of blue and red light on a vertical cinema type screen which had on it an outline map with a grid : the blobs originated from several hand-held devices, the operators of which presumably received a stream of updating reports from the radar operators who were using basic A scan CRT displays. Jagdschloss was another machine for tracking bomber formations at long range. This rotating device of I50 kW had 18 dipoles and for this the operator did have the benefit of a PPI display. Pulse length was 1 microsecond and the PRF was 500. The Germans also developed an unlikely-to-be-jammed passive radar known as Klein-Heidelberg. The equipment very easily picked up the pulses from a particular CH transmitter via a simple fixed aerial directed towards it by Receiver 1, and also separately the omnidirectional reradiated returns initiated by the same CH transmitter from a target aircraft via a manually controlled partially rotatable large reflector equipped aerial feeding Receiver 2. The time base for this display was triggered from the pulse picked up by Receiver 1.The distance to the CH source was known from maps and its angle from the Receiver 1 was also known. The range of the target could be determined by the time taken for its reradiated signals to arrive, as measured on the Receiver 2 display. Thus the lengths of two sides of the triangle were known as are the necessary angles. A little trigonometry could reveal the target's distance. ( Or something like that!) This undetectable system was designed to beat our extensive Mandrel jamming of the "normal" German radar system, but only came into effective use during the very last months of the war. However it is understood that the principles have many applications in the modern world under the name of Bistatic Radar". This link gives a more comprehensive description of the system. By the end of the war many variations of the Freya had been developed. The Wasserman consisted of as many as eight Freya arrays mounted on a single column to give exceptionally good heights. Another version had one Freya array which could be hoisted up and down a central column to suit varied height detection requirements. Yet another had a cabin mounted half way up a column with two arrays mounted above and below. The Mamut (Mammoth) was a huge fixed array, 98 feet wide and 30 metres high, with no less than 192 dipoles which could be fired in groups allowing a variety of horizontal angles up to a hundred degrees to the beam produced. If these were fired in sequence then "sector scanning " would have been achieved. It was equivalent to 16 Freyas and had 200kW of power giving a 200 mile range (but no heights). Known as "The Hoarding" to allied pilots it was the forerunner of the modern "phased array". At some sites two worked back to back. T Force, a combined services organisation tasked with saving and recovering German scientists and artefacts at the very end of the war and after, discovered at Pelzerhaken, north of Lubeck "massive permanent installations directed eastwards to cover the Baltic coast. The largest was 25m across. In the surrounding area they found vast numbers of radar systems from basic earlier models to the most advanced as if it were some sort of informal radar museum of radar." Also in the Harz mountains in southern Germany they found an underground store containing radar components including the latest "Berlin" sets complete with their magnetrons and waveguides." In addition at Skisby in Denmark they found the "Wullenberg" a circular antenna system to triangulate radio signals over large distances. It consisted of 40 vertical aerials in an arc of 120m diameter. The Americans developed this system designated as FLR9 which was installed in nine locations around the world, the system being coded as "Iron Horse". Having a range of up to 5000km., two or more stations working together could intercept a radio message and determine its source. One of these stations was in the UK at RAF Chicksands near Letchworth. The first three pictures were sourced from Wikipedia links under Freya & Wurzburg, the source sites having larger pictures some of which are in colour, and the last two were found in a most informative site Vectorsite, to which you should now go if you need to know a whole lot more about German radar. Alternatively, try these, Radar World. or Foundation for German Communication.